Instant competitive price on all batteries, Car, SUV, Light Commercial, Motorbike, Quad, Jet Ski and Golf Trolleys. Safe & Secure Nationwide delivery. At AutoFastFit, we pride ourselves in only keeping the best brands and brands we trust. Auto Fast fit is a family run business established over 40 year ago. We have been selling and fitting batteries since then and take pride in only offering the premium quality car parts at discounted prices. we keep various brand options for each product, which will allow you to choose by price or preferred brand. Auto Fast fit have been using Yuasa for many years. With our commitment to quality and customer satisfaction, our relationship Yuasa has stood the test of time. 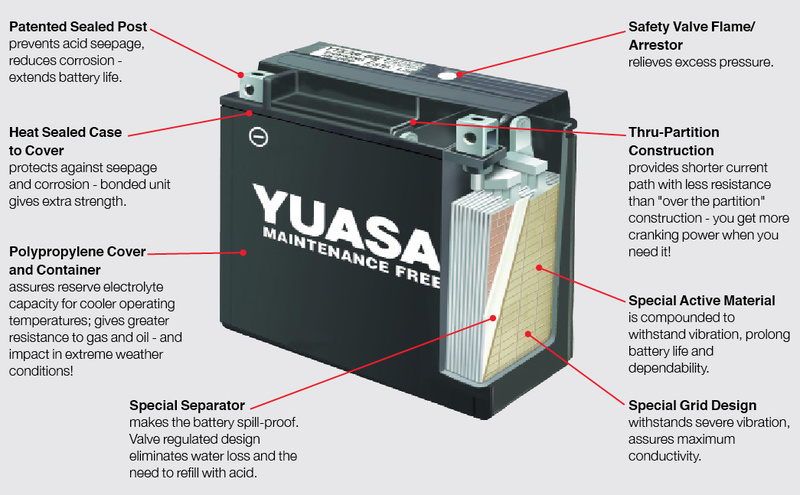 Yuasa are world leaders in valve regulated lead-acid battery design and manufacture and have automotive battery, industrial battery and motorcycle battery distributors all over the world. A battery is a device for storing electrical energy in a chemical form, and then releasing it as direct current in a controlled way. All types of batteries contain a positive and a negative electrode immersed in an electrolyte, the whole assembly being within ?a container. Most Yuasa batteries are lead-acid batteries, which means that they have positive and negative electrodes made of lead compounds in a dilute sulphuric acid electrolyte. Lead-acid batteries are secondary batteries, which means that they can be recharged after they have been discharged. ?Primary batteries can be discharged only once and then have ?to be thrown away; examples are some types of torch and ?radio batteries. The positive electrode is made of lead dioxide and the negative electrode is made of porous lead. When an electrical load (for example lights or a starter-motor) is connected across the battery, a current flows through the electrolyte in the battery and through the external load. This causes the battery to discharge, which results in the chemical composition of both the electrodes changing to lead sulphate. A battery can be charged by putting a current through the battery from an outside source of electricity such as an alternator, dynamo or charging unit. This converts the lead sulphate back to the original materials of lead dioxide and porous lead. As the battery becomes charged, the electricity begins to decompose (hydrolyse) the water in the electrolyte into its constituent elements of hydrogen and oxygen, which are released as gas. This is why a battery gases when it is charged. As the positive and negative electrodes are made of weak materials, they need a mechanical support which is provided by a grid made from a lead alloy; lead on its own would be too soft. In addition to providing a support for the electrodes (the active material), the grid also conducts electricity from the electrodes to the outside load. The electrodes are initially made from a mixture of lead oxide and lead sulphate. This is converted into lead dioxide in the positive plate and porous lead in the negative plate when the battery is initially charged. The negative electrode also contains small amounts of additives to give the battery a good discharge performance at low temperatures to improve starting. The combination of grid and electrode is normally called a plate. Most modern separators are made of microporous polyethylene, which has the right properties to meet the demanding conditions within the battery. What Makes a Battery Maintenance-Free? 30 years ago, batteries lost water at a high rate, and motorists were advised to check the acid level as one of their weekly checks; modern maintenance-free batteries need no water addition throughout their life under normal operating conditions. Incidentally, during the same period, battery life has doubled from 2 years to 4-5 years. In the past, battery grids were made of an alloy of lead with 10 per cent of antimony; the purpose of the antimony was to give rigidity as pure lead would be too soft on its own. Unfortunately, some of the antimony dissolved in the acid and resulted in the battery losing water. With improvements in battery technology, we have been able to reduce the antimony content from 10 per cent to 1.5 per cent, and this reduction has resulted in batteries that are low maintenance, needing only yearly attention. The latest improvement has been the use of 0.1 per cent of calcium as a hardening agent in grids in place of antimony; this causes less contamination of the acid and much reduced water loss, making the battery maintenance-free so no water needs to be added during its operational life. Modern car charging systems allow only a small current to flow into the battery when it is fully charged. If there is a fault in the alternator, a much higher current will pass through the battery all the time that the car is running. This current will cause the battery to lose water rapidly, destroying the maintenance free characteristics of the battery, and will also reduce the life of the battery by damaging the positive grids. A dark brown/black colour on the bottoms of the vent-plugs is a strong sign of overcharge. If an alternator (non Start-Stop vehicle) has a voltage above 14.8 Volts at normal temperatures, this is a generally sign that the charging system is faulty. The common diode fault in the rectifier will see charging voltages of 16.0V at the battery, the alternator should be repaired immediately to prevent any further damage to the battery. Note with latest Start-Stop vehicles with Brake Energy Regeneration, higher voltages (15.2V) are used to maximise charging efficiencies and reduce alternator charging periods. Modern charging systems keep the battery in a high state-of-charge while the car is running under most operating conditions. However, the battery will discharge under abnormal conditions or if the car is allowed to stand with a load on, for example, lights. On modern cars when parked, there is normally a constant drain on the battery caused by such components as the computer, alarm system, clock etc, and this will cause the battery to become discharged. Depending on the vehicle, this can take weeks or months. Vehicle batteries are designed to accept some cycles of discharge and recharge, but are not designed for applications in which there are constant cycles of charge and discharge (deep cycling). Leisure batteries have been designed for these types of application, and have a special construction to enable them to be deep cycled on a continuing basis. Continual deep cycling of vehicle batteries will cause failure as the positive active material will gradually fall to the bottom of the battery, reducing the ability of the plates to store electricity. A large number of small black/brown particles in the electrolyte are a strong indication that the battery has been deep cycled. Sulphation is a normal part of the operation of a battery and occurs whenever a battery is discharged. When the battery is recharged, the sulphation (lead sulphate) is changed back into active material. If a battery is left flat for a period of time, this sulphation slowly changes its form into one that cannot be changed back into ?active material on charging, so, after charge, the battery will not return to give its original performance. If the sulphation is bad enough, the car will not start. This is the problem normally referred to as sulphation. Undercharge occurs if the battery is not receiving enough charge to return it to a full state-of-charge; this will slowly cause sulphation. This fault can occur if the car is being used only occasionally for short journeys, or for Start-Stop urban motoring. Undercharge will also occur if the alternator voltage is in the region of 13.6 – 13.8 Volts .